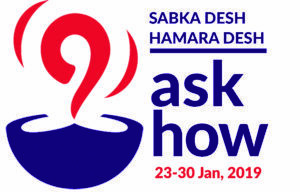 The Ask How campaign brings awareness to people about the rights that are enshrined in our constitution and how these constitutional rights are to be safeguarded from fundamentalist and neoliberal onslaught. The Constitution of India was passed in the Constituent Assembly on 26th November, and came into effect on 26th January 1950. The constitution declares India a sovereign, socialist, secular, democratic republic, assuring its citizens justice, equality and liberty, and endeavors to promote fraternity. This meant that all sections of people – irrespective of race, religion or caste – had full rights to the nation, including the right to a decent standard of living, embedded in the Indian Constitution. It was for a secular India that Mahatma Gandhi was martyred. The secular republic, and democracy, both social and economic, are under threat today. It is this vision of economic democracy that united Jawaharlal Nehru and Subhash Chandra Bose with Dr.Ambedkar. In their vision, planning and building a public sector was an absolute necessity not for just industrial and agricultural regeneration of India, but also re-distributing the benefits of development to all sections of its people. It is only by state intervention in the economy that an independent India would be able to free India from absolute poverty, famine, abysmal life expectancy and illiteracy that the British colonial rule had imposed on India. Let us remember all the four stalwarts of our Republic – Mahatma Gandhi, Jawaharlal Nehru, Dr. Ambedkar, and Subhash Chandra Bose – in the week of 23rd January, Subhash Bose’s Birthday, to 30th January, when Mahatma Gandhi was assassinated by Godse. It is important for us to remember these four leaders for what they represent: a truly democratic, secular republic. Particularly, when we see violent attacks on minorities and dalits, with tacit or, open support of the government. The All India Peoples Science Network will campaign with the people on the promise of secular democratic republic that the national movement had created, and oppose all attempts to derail it. We see repeated attempts to pit Ambedkar, Bose, Patel and Gandhi against Nehru. Sections that do this, believe that our memories are weak, and that we have forgotten our past. Yes, of course all these leaders had differences among themselves. They were leaders with strong views, and were willing to disagree, sometimes sharply with each other, on the direction that the national movement should take. But unlike leaders in the RSS–Hindu Mahasabha, the ideological founders of the BJP, and the Muslim League, they all fought against the British for an independent India. Bose mentions contemptuously how the Hindu Mahasabha and the Muslim League were pro-British, and kept themselves out of the national struggle. He and Nehru believed in planning and in science to lift India out of its desperate poverty. Both drew inspiration from the socialist experiment in Russia, which in two decades, had lifted it out of extreme backwardness, and turned into a modern nation. They were both deeply secular and socialistic in their outlook. Nehru, unlike Bose, was clear about the threat that fascist forces represented to the world. Bose saw the Axis powers as an enemy’s enemy – the British was his main enemy – and was willing to ally temporarily with them. But unlike the RSS–Hindu Mahashba, they were united in their vision of planning the economy, economic democracy and science in a free India. Not in mumbo jumbo science, which our council of ministers led by the PM, seems to believe. The Planning Commission carried forward the vision of the Planning Committee, set up by Bose as the President of the Indian National Congress in 1938, and headed by Nehru. Its winding up and replacement by a think-tank called Niti Ayog, is an indication that economic democracy is no longer on the agenda of the current BJP-led NDA government. Lest we forget, Bose, as much as Nehru, was an ardent believer in planning, and talked about the need for a Planning Commission to guide the government in an independent India. It is not surprising that the other development of the Indian Constitution of affirmative action, namely reservation, in education and employment, was opposed by the RSS. Even today, the RSS leaders speak against reservation, that it promotes separatism and how it should be wound up. The recent attacks on minorities and Dalits, the movement to project the lives of cows being far more important than that of human beings, is an attack on our secular and democratic values. It is the same forces that attack minorities that also attack reservation, women’s right to love and marry freely, and the way we want to live. Every facet of our culture and democracy is today under attack, from freedom of speech to the right to practice our religion and our culture. This is not just an attack on our minorities. These attacks are taking place when India has again become as unequal as it was under the British; or what the French economist Piketty called it: from British Raj to Billionaire Raj. When crony capitalism is ruling the country; where 1% of people own wealth equal to 73% of Indians. There is an attack on the fundamental constitutional values of the republic – social and economic democracy, and no discrimination against any section of society based on caste or creed. This is what we have to fight against, this is our battle for a sovereign, socialist, secular democratic republic that our forefathers fought for during the independence movement. (TNSCST) Govt.of Tamil Nadu, Chennai was held from Dec-28 to 30, 2018 at Mannar Thirumalai Naicker College, Madurai, Tamil Nadu. The specialty of the programme was the interaction of Tribal children of other states and local children of Madurai by science and cultural activities to understand the diversity. And also the children of Madurai hosted the children of other state by taking them to their homes during nights for two days to understand the day today lives of the locals. A cultural and heritage tour on 30th (1/2 day) : this cultural and Heritage tour was flagged off by Additional Divisional Railways Manager on 30th at 9AM in front of the junction. The students and their guides went in six buses to 4 different buses , Yanamalai, Alagar Koil, Keelakkuyilkudi and Gandhi Museum. This half a day heritage and nature tour was organized by which students were exposed to the ancient history, culture and existing habitats in around Madurai. And a valedictory session on 30th AN (1/2 day) A souvenir with the drawings of children and multilingual songs on Science released by Madurai SBOA Principal and a special address by Dr.S.Nagarthinam, MK University. The All India Peoples Science Network (AIPSN) decided to join the Global March for Science to on 14th April, 2018. The AIPSN sees a pattern in the attacks on science and reason across the world. The US President Trump’s denial of climate science, and the current Indian central government Ministers’ rejection of evolution, and other scientific advances, are prime examples. See a Video report here.